Over 50 years into his career, Paul McCartney is still leading the way. He continues to push boundaries, create new albums, perform to millions and make global news with countless monumental shows. McCartney is releasing a new album, Egypt Station, this September. He’ll be supporting it with his first UK dates in three years this December as part of his Freshen Up tour. It will be stopping London, Birmingham and Glasgow. McCartney’s last concert in London took place in 2015 during his massive Out There world tour, while his last visit to Scotland was in 2010 on his Up and Coming tour. Sharing a title with one of hiss own paintings, Egypt Station is the first full album of all-new McCartney music since 2013’s international chart-topping NEW. Two of its tracks were released earlier this summer – the ballad I Don’t Know and the raucous stomper Come On to Me. Seeing McCartney live is everything any music lover could ever want. On his Freshen Up tour, expect nearly three hours of the greatest moments from the last five decades of music as well as dozens of songs from his solo, Wings and Beatles catalogues. McCartney and his band have played an unparalleled range of venues and locations throughout the UK, Americas, Europe, Japan, Australia, New Zealand and all points between – such as outside the Coliseum in Rome, Moscow’s Red Square, Buckingham Palace, The White House, a free show in Mexico for over 400,000 people, the last ever show at San Francisco’s Candlestick Park where The Beatles played their final concert in 1966, a 2016 week in the California desert that included two headline sets at the historic Desert Trip festival and a jam-packed club gig for a few hundred lucky fans at Pappy & Harriet’s Pioneertown Palace. They even played one performance broadcast live into space! As anyone who has seen him will confirm, the live experience goes so much further than simply a normal concert. Throughout, McCartney takes his audience on an emotional journey that touches everyone in a different way. Whether performing to just 200 or 500,000 people, he has the ability to connect with everyone in the audience. 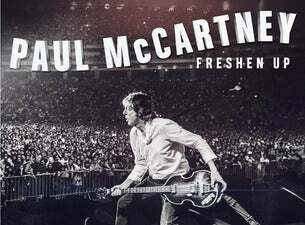 On the Freshen Up tour, McCartney will bring his band of the last 15-plus years: Paul “Wix” Wickens on keyboards, Rusty Anderson on guitar, Abe Laboriel Jr on drums and Brian Ray on bass and guitar. Along with state-of-the-art audio and video technology ensuring an unforgettable experience from every seat in the house, a Paul McCartney concert is truly a once-in-a-lifetime-experience.